The formation of The Sunflower Fund in 1999 was inspired by the heroic struggle against leukaemia of two brave young men, Darren Serebro (1997) and Chris Corlett (2000). It was started by a group of concerned parents whose children had contracted leukaemia, and sadly, in some cases had lost their battle against it. These young men’s fortitude and willingness to share even the darkest moments of their short lives awakened a flood of public support, which resulted in the birth of the Friends of the South African Bone Marrow Registry Foundation. 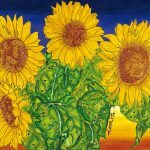 The original ‘Sunflowers of Hope’ painting was completed by 17-year-old Chris Corlett while he was being treated for acute lymphoblastic leukaemia. This was founder patron Tina Botha’s main inspiration for the name change to The Sunflower Fund. Tina Botha’s commitment to growing the number of registered donors in South Africa meant that she turned her loss into something powerful and positive. She held the role of CEO of The Sunflower Fund for 13 years and made the transition to founder patron in 2013. Tina’s daughter, Tarryn Corlett, assumed the role of CEO until August 2015. Alana James was appointed CEO of The Sunflower Fund in September 2015. She has a wealth of experience from a career spanning nearly two decades in the corporate and NGO sectors across South Africa and Africa. Alana ran her own business for four years as a Strategy Consultant and is currently Non-Executive Director on the board of the Cape Chamber of Commerce, Chair of Northlink FET College Council amongst board roles and a business coach. Alana’s primary aim is to continue to grow the strength of The Sunflower Fund brand and to develop the understanding of all South Africans regarding the organisation’s cause, through strategic partnerships locally and within the global Stem Cell (bone marrow) registry network. Under her leadership The Sunflower Fund has become one of the founding members of the Stem Cell Registry Alliance (SCRA) a network of registries across the Caribbean, Africa and Europe committed to recruiting donors of African descent. In March 2018, The Sunflower Fund became a Provisional Registry with the World Marrow Donor Association, now recruiting donors for The Sunflower Fund’s stem cell registry. In January 2018, The Sunflower Fund and The Moore Foundation formalised a partnership to extend donor recruitment and registry services into Ghana. Please let us know if you have any questions; we are more than happy to help. Signup to our newsletter to receive the latest updates from The Sunflower Fund.